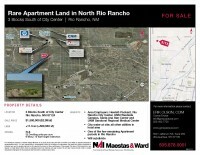 Property #1 is located 3 blocks south of City Center in Rio Rancho, NM, 87124. Close proximity to Hewlett-Packard, Rio Rancho City Center, UNM Westside Campus, Santa Ana Star Center, and UNM Sandoval Regional Medical Center. City Water at site; all utilities in local area. One of the last remaining Apartment Parcels in Rio Rancho. Property #2 is located at 21st Street SE & Southern Boulevard SE. Rio Rancho, NM, 87124. Property is 1.3 miles north of Rio Rancho Presbyterian Hospital and 5.5 miles south of UNM Sandoval Regional Medical Center. Divisble to 1.5 acre tracts. City utilities adjacent to site.